The Han Chinese wrote of southerners Viet people as follows "The Yüeh people by nature a indolent and undisciplined. They travel to remote places by water and use boats as we use carts and oars as we use horses. When they come (north - to attack) they float along and when they leave (withdraw) they are hard to follow. They enjoy fighting and are not afraid to die." 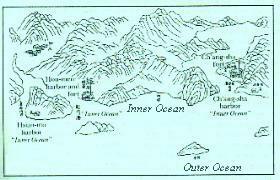 (See "Eighth Voyage of the Dragon", Bruce Swanson, Naval Institute Press, Annapolis 1982, page 11-12). The conflict between the Philippines and China over the Scarborough Shoal may appear at first sight a minor dispute over an uninhabitable rock and surrounding shallow waters. But it is hugely important because it encapsulates China’s assumption that the histories of the non-Han peoples whose lands border two-thirds of the waters known in English as the South China Sea are irrelevant. The Philippine case over Scarborough has been mostly presented as one of geography. The feature is 135 nautical miles from Luzon, the main Philippine island, and roughly 350 miles from the mainland of China and 300 miles from the tip of Taiwan. 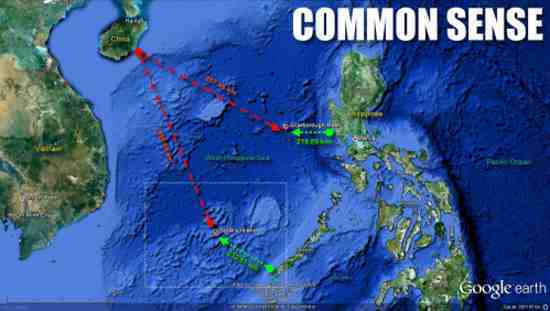 It is thus also well within the Philippines’ Exclusive Economic Zone. China leapfrogs these inconvenient geographical truths to come up with justifications of its claims which can be applied to the whole South China Sea and thus justify the dotted line on map which vaguely defines them. This line has never been precisely delineated but comes well within the 200-mile limits of all the other countries, and close to Indonesia’s gas-rich Natuna islands. In the case of the Scarborough Shoal, its historical justification is that this rock and surrounding shallow water is mentioned in a Chinese map of the 13th century when China itself was under alien – Mongol – rule. The fact that a vessel from China had visited the shoal and recorded its existence has thus become one basis for its claim. Very similar pieces of history are trotted out to justify claims to other islands visited by ships from China. Likewise, China’s assumption of hegemony is often based on the fact that foreign merchant ships had to pay taxes to trade with China. History, however, shows that Chinese sailors were latecomers to the South China Sea, let alone to onward trade to the Indian Ocean. The seagoing history of the region, at least for the first millennium of the current era, was dominated by the ancestors of today’s Indonesians, Malays, Filipinos and (less directly) Vietnamese. Thus, as China’s own records reveal, when the 4th century Buddhist pilgrim Fa Hsien, went to Sri Lanka, he travelled from China to Sumatra and then on to Sri Lanka in Malay ships. This was not the least surprising given that during this era of sea-going prowess, people from Indonesia were the first colonisers of the world’s third largest island, Madagascar, some 4,000 miles away. (The Madagascan language and 50% of its human gene pool are of Malay origin.) 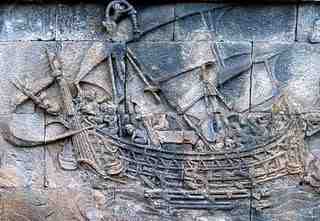 This was a thousand years before the much-vaunted voyages of Chinese admiral Zheng He in the 15th century. Malay seagoing prowess was to be overtaken by south Indians and Arabs, but they remained the premier sea-farers in Southeast Asia until well into the era of European dominance of the region. Indeed, the Malay-speaking Hindu (like much of Southeast Asia at that time) mercantile state of central Vietnam dominated South China Sea trade until the 15th century. The 10th century Arab traveller and geographer al-Masudi made reference to the “Cham Sea”, and trade between Champa and Luzon was well established long before the Chinese drew their 13th century map. As Scarborough Shoal not only lies close to the Luzon coast but is on the direct route from Manila bay to the ancient Cham ports of Hoi An and Qui Nhon, it was known to the Malay sailors long ago. All in all, the Chinese claim to have ‘been there first’ is like arguing that Europeans got to Australia before its aboriginal inhabitants. But given China’s reluctance to acknowledge that Taiwan was Malay territory until the arrival of European conquerors, and then of a surge of settlers from the mainland, such refusal to acknowledge the rights of other peoples is not surprising. At times, China itself seems to recognise the flimsy basis of some of its historical claims. In the case of the Scarborough Shoal, it backs up its position by reference to the Treaty of Paris 1898 concluding the Spanish-American war and yielding Spanish sovereignty over the Philippine archipelago to the US. This did not mention the shoal but described a series of straight lines drawn on the map which left the shoal a few miles outside the 116E longitude defined by the treaty. Given that China rejects “unequal treaties” imposed by western colonialists, it is remarkable to find it relying on one between two foreign powers conducted without any reference to the inhabitants of the Philippines. Vietnam can equally well claim all the Spratly Islands as inheritor of French claims over them. For sure, China has the power to impose its will. But its aggressive stance towards the Philippines, so often seen as an especially weak state, has alerted others, including Japan, Russia and India as well as the US, to its long-term goal which is not ownership of a few rocks but strategic control of the whole sea, a vital waterway between northeast Asia and the Indian Ocean, the Gulf and Europe. The Scarborough Shoal is not just a petty dispute over some rocks. It is a wake-up call for many countries. Philip Bowring is former editor of the Far Eastern Economic Review.